Refugium Setup using small fish tank (normally 20-gallon size) is getting popular nowadays and is considered an important unit that supports every marine tank. But before we learn on how to set up the refugium unit, let us begin by understanding the definition of what a refugium is and the main function of using it. A refugium is actually considered as a backup tank separated from the main aquarium and it is actually a standalone unit, usually a simple setup using just a small tank made for the sole purpose of growing live foods such as algae to feed your saltwater tropical pet fish and at the same time function as an aquarium filter. The most common setup which I would recommend is by placing the refugium at an elevated level higher than your main fish tank usually at about 1 meter height and by using a pump to transfer water to the refugium and let the water overflow naturally (through a piping) by gravity back to your main marine fish tank. There are several advantages using this construction arrangement firstly because you will avoid water from overflowing from either your main marine tank or even your refugium and since there’s forced circulation moving the water from one unit to another, this will improve level of dissolved oxygen considerably. One of the main reasons of using a refugium is that algae are almost impossible to grow in your fish tank since they will get eaten easily. With that, you actually have no control towards the amount of food you intend to feed your fish and whatever there is will be consumed immediately. Therefore, refugium is also considered a conservation unit whereby algae will be allowed to propagate without disturbance from the fish and then scooped up only when needed. If you also remember what has been mentioned earlier, a refugium can also function as a natural aquarium filter. The reason why I’ve said so is because you can set the refugium on a reverse daylight schedule whereby if your main marine tank is lit up during the day, then the refugium light be off going in reverse. Therefore what you achieve is that the supply of oxygen generated from photosynthesis will always be continuous enough to support every living organism within the system. A simple refugium setup does not mean having to spend excessively because basically the tank is very much similar to your main fish tank. What you actually need to have is an extra fish tank complete with powerful metal halide lighting system while the rest of the makeup material such as substrate bed plus corals or live rocks can be sourced and taken directly from your main marine setup. The pump that functions to transfer water from one unit to the other should be sized according so that it does not create extra turbulence especially since your refugium is housed in a small tank. 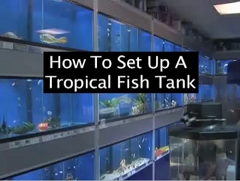 I would definitely recommend using this setup for any aquarium hobbyist interested to construct their own refugium unit for their new pet fish.